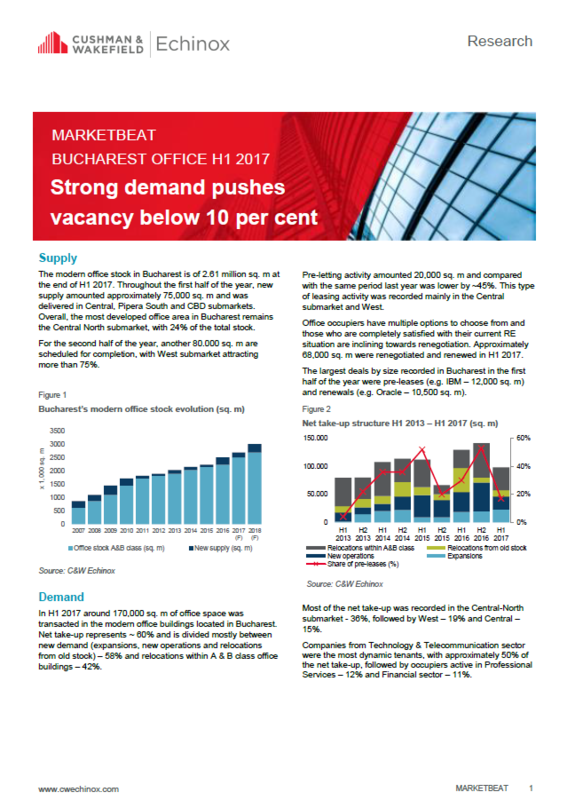 • The modern office stock in Bucharest is of 2.61 million sq. m at the end of H1 2017. • In H1 2017 around 170,000 sq. m of office space was transacted in the modern office buildings located in Bucharest. • Pre-letting activity was lower by ~45% compared with the same period last year. This type of leasing activity was recorded mainly in the Central submarket and West. • For the second half of 2017, new supply is forecasted to be around 80,000 sq. m, with West submarket accounting for more than 75%. Although the number of projects under construction is high, the vast majority of office projects have been postponed for 2018.